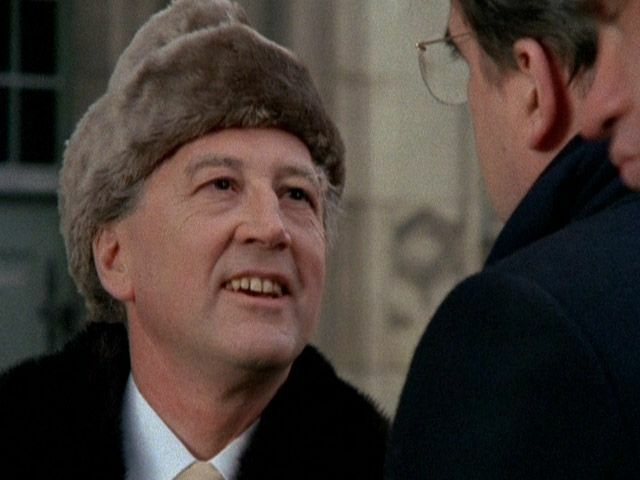 Alec Guiness in Smiley’s People (1982). Where Tinker, Tailor, Soldier, Spy was grounded in England, Simon Langton’s adaptation of John Le Carre’s Smiley’s People is pervaded by continental gloom and suspicion. The series starts with an old Russian general played by veteran actor Curd Jürgens. He defected to England many years ago and still runs a spy ring for British intelligence but he has been designated to the so called oddbins: old networks who have lost their importance. Through his contacts the general has found a principal associate of Karla, the head of Russian counterintelligence, in Paris. With the help of the seedy and mysterious Otto Leipzig (a wonderful Vladek Sheybal) he frames the Russian spy who spoils some valuable information. 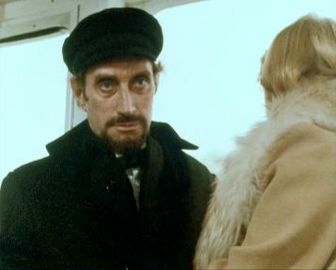 Otto Leipzig (Vladek Sheybal) in Smiley’s People. 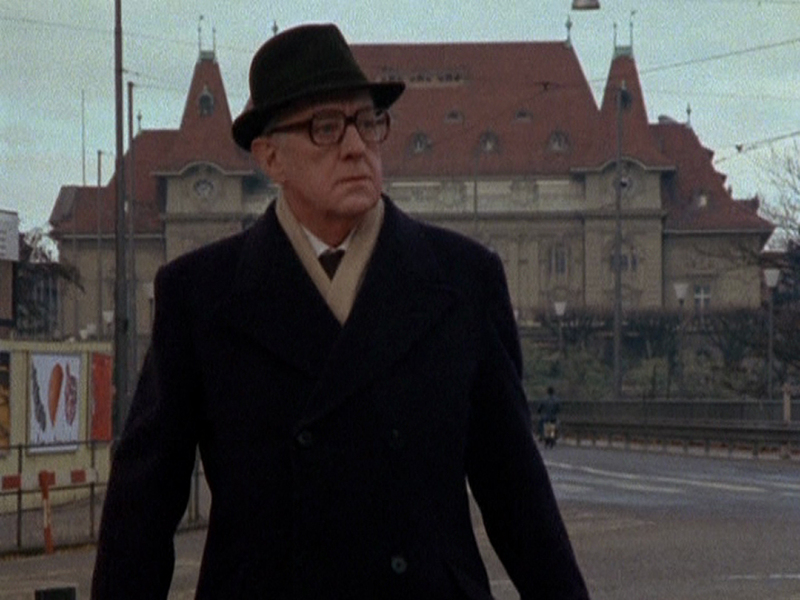 It is these shady dealings that George Smiley uncovers when he has to investigate the murder of the general and the trail that’s left behind through Europe. In comparison with the previous series you can see that the BBC had quite a budget. From the boulevards of Paris, the action moves to the sleazy streets of Hamburg. The action culminating in the deceptive safety of Switzerland and ending in the divided city of Berlin. Apart from this grand tour that the always polite and inconspicuous Smiley undergoes, some things remain the same. He still has the sharp and bitter Connie Sachs at his disposal and her unfailing memory. Beryl Reid again has some great lines as Connie: ‘Still terrifying the virgins of Paddington?’ A superb Bernard Hempton reprises his role as the charming but imprudent Toby Estherhase. Once a bigwig at the Circus, but now a dodgy art dealer who confesses that at a certain age man has to be what he deserves. In his case, being a cheap Hungarian in expensive clothes. From these examples one can gather that the wonderful use of language is also still there. This time the script was written by Le Carré and John Hopkins and it retains the clandestine argot with all those witty code words. Smiley is called a Rogue Elephant by his superiors. Spy rings have Vicars and Postmen and the cautious general insist on playing by Moscow Rules. Toby Estherhase (Bernard Hempton) in Smiley’s People. All these elements that one recognizes from the first series get extra continental credibility from an excellent supporting cast from over the channel. The aforementioned Jürgens and Sheybal are perfect as the old general and the eccentric Leipzig. Rainer Werner Fassbinder regular Mario Adorf convincingly plays the owner of a club on the “clean side” of Hamburg’s St. Pauli district. 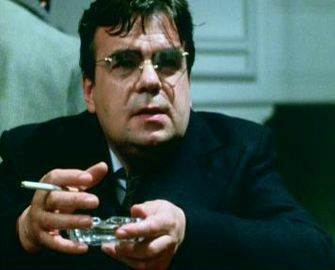 And then there is the great Michael Lonsdale as an apparent nebbish Soviet official who Smiley skilfully interrogates in a wonderful scene. Michael Lonsdale in Smiley’s People. But beneath the spy stuff there is still melancholy and indignation. It is all fed by the painful realisation that one has to accept changes that seem careless and wasteful but are presented as progress. And so Smiley confides to one of his loyal deputies a modest but valid thesis on history: ‘In my time I have seen Whitehall skirts go up and down again. Seen good men go to the wall and the idiots been promoted with a dazzling regularity.’ The cold war has had its fair share of expendable and unnecessary victims but Smiley concludes that in a shifting world you can only try to hold fast.